Hadeel Abdallah is a first-generation college student at the University of Kentucky. She is the first female from the university and the 10th UK student ever named a Rhodes Scholar, the last being selected in 1955. 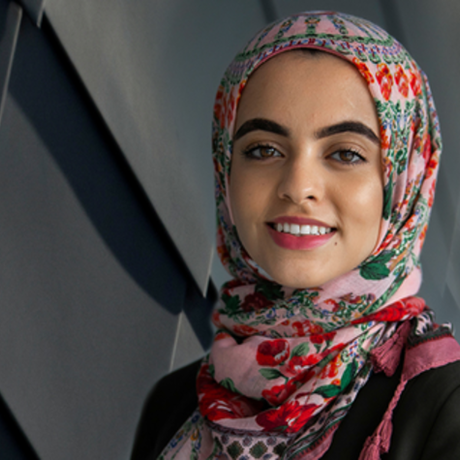 Hadeel is passionate about solving educational disadvantages faced by underrepresented populations and is interested in solving inequalities within the textile and business industry. As President of the Muslim Student Association, Hadeel spearheaded the Refugee Benefit Gala, raising over $30,000 for the Islamic Society of Central Kentucky and Kentucky Refugee Ministries. Hadeel is also the student founder of the University of Kentucky Bilal ibn Rabah Scholarship endowment. The first of its kind established in the United States, the Bilal ibn Rabah Scholarship was officially endowed in 2018 to reward potential students who come from backgrounds that have faced historical institutional oppression, are undocumented and/or are considered refugees. She is incredibly eager to provide future students (many of whom do not qualify for federal aid) with the opportunity to obtain a positive higher education experience that does not involve debt. You can now find her working on the Bilal ibn Rabah Scholarship Million Dollar Campaign, where she intends to raise $1 million dollars by the end of Ramadan to ensure that every Bilal Scholar receives a full-ride scholarship to the University of Kentucky. Aside from her student work, Hadeel is currently writing a novel and enjoys baking, swimming, and spending time with family and friends.